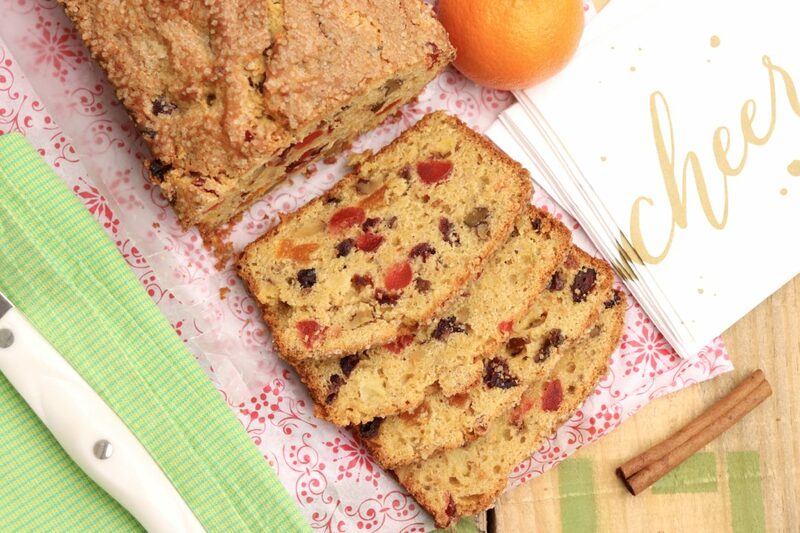 Finally…a fruitcake you’ll want to eat! This quick and easy batter bread is packed with fruit and nuts but unlike traditional fruitcake is less sweet and more mildly spiced. A name isn’t just a name. It’s an identity, and with that, it conjures up feelings and memories. In some cases, it also carries baggage. Such is the case for fruitcake, revered by some, detested by many. Growing up, no one in my family made, bought or otherwise consumed (at least to my knowledge) this holiday classic. Several years ago, however, my dad challenged me to produce a delicious fruitcake – which many consider an oxymoron. No matter, when your dad asks you deliver. But what created the newfound interest in fruitcake you may wonder? For sustenance on the trail, some of the hikers pack clementines and apples, but come each December, one member unveils his famous homemade fruitcake. Pete’s holiday treat is a bourbon-soaked beauty, bursting with dried fruit and nuts – and the guys adore it. The only problem? My dad can’t eat it, because the cake contains all-purpose flour and he’s allergic to wheat. Several years ago, Dad shared with me the ins and out of Pete’s fruitcake, down to the “ripening” process, which involves copious amounts of bourbon. Dad has always wanted to taste the fruitcake, of course, but I think what he really wanted was to be part of the banter than inevitably surrounds this holiday tradition. Fruitcake elicits strong feelings and lots of good-natured jokes. Dad wanted in on the fun! Since I never gave much thought to what would make the perfect fruitcake – one that people might truly be inspired to try – I did some research. In the process, I came across a recipe by King Arthur Flour that seemed more like a cakey quick bread than dense fruitcake. With very little tweaking, this recipe turned out to be one that my whole family enjoyed. As proof, I asked my kids one morning if they’d rather have a bowl of their favorite cereal or a slice or two of fruitcake. Without hesitation, they chose fruitcake! 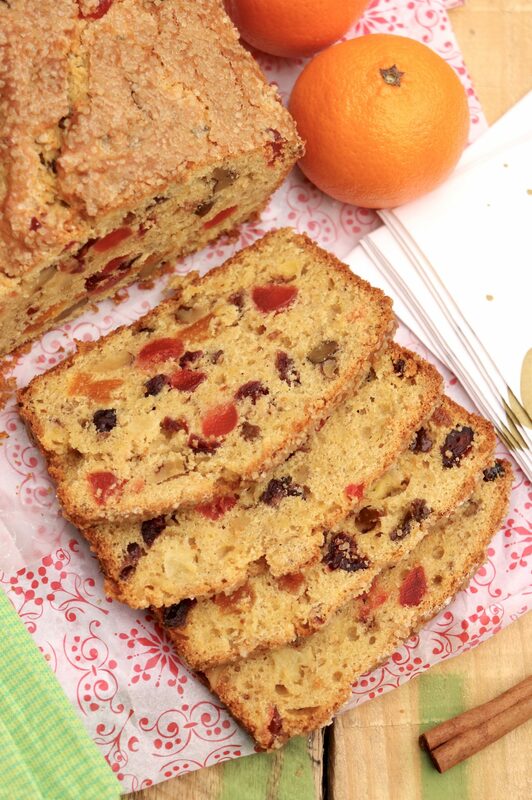 More quick bread than fruitcake, a slice of this is bright tasting, lightly sweet, and appealingly tender. Think shape and texture of a fruitier banana or zucchini nut bread. As with many spiced cakes, the taste will improve over time as the flavors meld, so feel free to bake this cake several days before you need it. 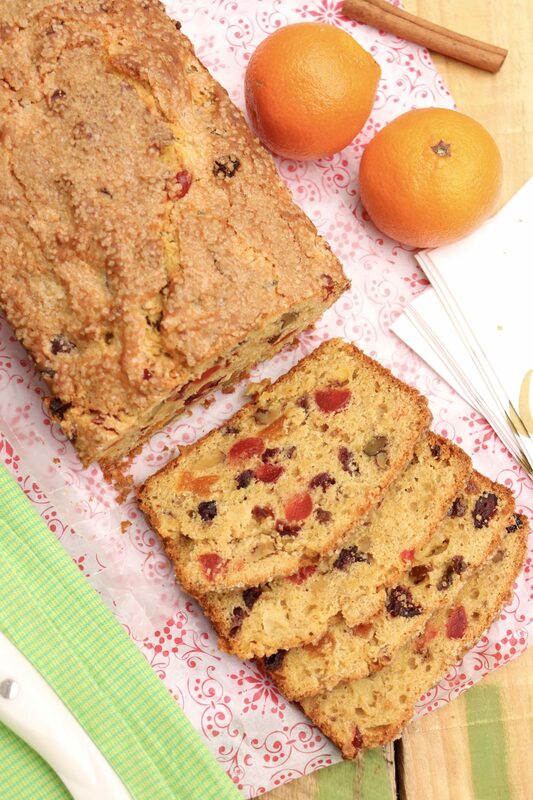 Fruitcake... or fruit bread? This quick and easy batter bread is packed with fruit and nuts but unlike traditional fruitcake is less sweet and more mildly spiced. Add the flour, beating on low to combine, and then add the crushed pineapple with all the juices from the can. Stir in the fruits, nuts and candied cherries. Spoon the batter into the prepared pan, smoothing the top. Sprinkle with the coarse sugar, if using. Bake the cake for 60 minutes. Check for doneness. (When in doubt, check with an instant read thermometer; it should register between 200 and 205 degrees F.) If the loaf is still not cooked through (this will depend somewhat on individual oven), tent it with aluminum foil, and bake for an additional 5 to 15 minutes, or until a cake tester inserted into the center comes out clean or the proper internal temperature has been reached. Remove the cake from the oven, and after 20 minutes loosen its sides, remove it from the pan and transfer to a rack to cool. *I use roughly equal parts dried apricots (chopped small), dried cranberries or cherries, and golden raisins. Dates would be a nice option, too. I like to chop the nuts in rather small pieces so they are better incorporated into the cake. Lastly, the candied cherries may be omitted or reduced. (They do give the bread that characteristic fruitcake look – which may be reason for some to use and others not to!) I like to use the cherries for color but quarter them so their presence is subtler. Recipe lightly adapted from King Arthur Flour’s 2008 Quick Fruitcake. Ann, Our trail names are Tuna, the Admiral, Stick, Splash, G.F. and Fruit Cake. We have been hiking for 12 years; first day hikes on the Appalachian Trail in Pennsylvania, Maryland and West Virginia and for the past 5 years walks on rails to trails in Lancaster, Chester, Lebanon and Northampton Counties. Hikes and walks have always been followed by lunch in a nearby tavern with a requirement that it serve bacon cheese fries to our standard. That means no bacon bits, no cheese whiz and the fries must not be soggy. We have been known to assist chefs not familiar with our standards. We have members who are knowledgeable about trees, plants, trailside structures, birds and almost anything else we see. (Expertise is based on who speaks first and with the most authoritative voice.) We have all learned about and enjoyed the beauty of Pennsylvania’s rural, hilly and river and streamside areas. County governments deserve credit for the great trails they have built which enable citizens to enjoy the beauty of our state while walking, running and biking. Hope this gives you a sense of what we do and how we enjoy it. Oh goodness, Ann, I love that story. I haven’t made this yet (I just found it at 10:40 p.m.), but I will tomorrow. 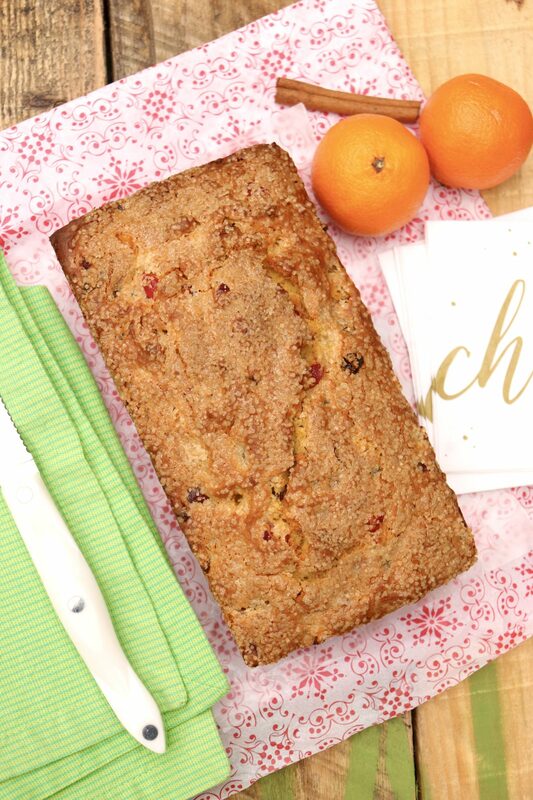 We have been looking for a gf, df fruitcake recipe that looks successful and this fruitCAKE bread (kids are smart) looks amazing! I’ll let you know how it comes out. Thanks so much for your comment, Leigh, and I can’t wait to hear what everyone thinks! This recipe is delicious! I do have 1 question- is there something I can add like vegetable oil to make it not so dry and crumbly? I’m so glad you like it, Susan, and to answer your question, the bread shouldn’t be at all crumbly or dry. It’s similar to a banana or zucchini bread in that respect. Did you add all of the butter by chance? The only other reason it might be dry is if the loaf was cooked too long. If neither of those suggestions provides a possible cause, let me know and we can troubleshoot further!